Monkey Bars are the Perfect Upgrade for the Little Gymnast. If your child is bored with the typical swing and slide combination, monkey bars might be the perfect upgrade. Monkey bars not only add a whole new level of excitement to a swing set, but they also help promote upper body strength, endurance and agility in your child. Children can experience endless adventure and get exercise. What is not to love about that? 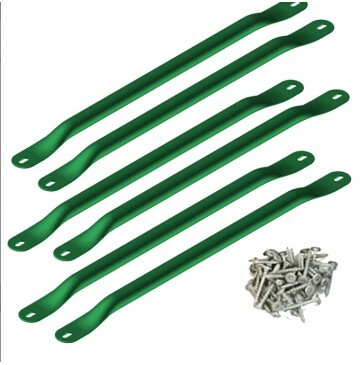 Each monkey bars kit includes (6) steel rungs, fully illustrated plans and all hardware required for mounting. Swing-N-Slide® warrants all of its monkey bar kits and accessories to be free from defects in workmanship and materials, under normal use and conditions, for a period of 5 years. Cosmetic defects that do not affect the structural integrity of the product, or natural defects of wood such as warping, splitting, checking, twisting, shrinkage, swelling or any other physical properties of wood that do not present a safety hazard, are not covered by this warranty.